Today is Send a Card to a Friend Day. And by card, I mean a gift card - a gift card from a local brewery tap room would be nice. Why not let someone know you care about them today and lift their spirits at the same time! Here's what's happening around the Colorado beerosphere today Thursday, February 7th, 2013. Our Mutual Friend Malt & Brew (Denver) - This Friday, February 8th at 7PM they'll be tapping a Weizenbock! It is the first special release batch by their assistant brewer Jan, and it is delicious. Come get a pour and high-five him. Wafflegänger will be here too! Party. Cannonball Creek Brewing Co (Golden) - The tasting room will be open today through Sunday at 3:00 PM daily. Their Mindbender IPA is back on tap and their Almond Chocolate Stout debuts today as well. Delicious tacos will be provided by Mcdevitt Taco Supply tonight! CAUTION: Brewing Company (Denver) - Coming up this Saturday, February 9th, just in time for Chinese New Year it's the release of their new Snake Hug Spicy Chinese Red. It's like uncomfortably close cuddling, just how you like it. Tivoli Beer (Denver) - Sigi's beer is back after a 139 year hiatus. Buck Beer returns to Colorado. Sigi's Wild Horse Buck Beer is a recreation of a long lost beer style that was once the most popular beer in Colorado. You can enjoy one on tap starting tomorrow, February 8th, at Dazzle, the Denver Turnverein, and more locations in the near future. Avery Brewing (Boulder) - Beer Lovers - Get Vertical this Valentine's Day! For this year's day of passion, Avery is digging deep into their cellar to create an epic, gourmet beer pairing dinner featuring three barrel-aged series beers and and three different 3-year verticals. Paired with some of the most decadent dishes from their friends at Savory Cuisines and guided by Adam Avery. Tickets are $100 and available at the Avery Tap Room. Upslope Brewing (Boulder) - Come check out their cask conditioned mint chocolate Foreign Stout today at Oskar Blues Home Made Liquids & Solids in Longmont. The hammer drops on this cask at 4:00pm sharp. Celebrate happy hour! New Belgium (Fort Collins) - Starting in March, New Belgium will be doubling down on the hops and introducing Rampant Imperial IPA, a new hop-forward beer and will become part of their year-round offerings. Rampant has 8.5% ABV and a big 85 IBUs. 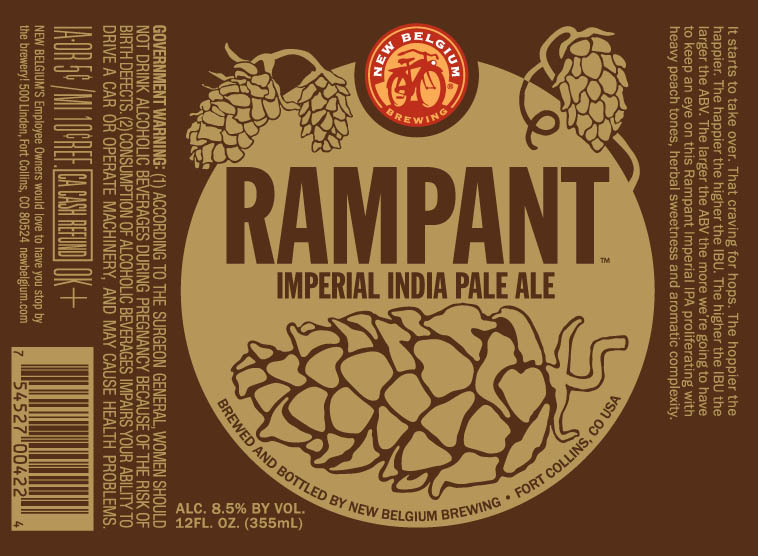 With the arrival of Rampant, New Belgium has opted to retire Belgo IPA, which was introduced in August 2010. Rampant joins their other hop-forward beers like Shift and Ranger IPA. Verboten Brewing (Loveland) - They've only been open a few weeks and already they are expanding their tasting room hours. Starting next week, February 12 & 13, Verboten will be opening on Tuesdays and Wednesdays. They'll have Happy Hour - $1 off beers from 3pm to 6pm. Black Bottle Brewery (Ft. Collins) - Starting today, Black Bottle has launched a new lunch special (Super Duper). Monday through Friday from 11am to 3pm. You can get your choice of 2 sliders, your choice of a side salad or side waffle fries, your choice of a Black Bottle beer*, and a free staff cartwheel all for $7.99. (*you can substitute beer with a non-alcohol beverage). Pateros Creek Brewing (Ft. Collins) - Feelin' blue? Perfect! Then you'll love their Chuck (Blue)Berry ale - their latest Outlaw tap. It's their Spiranthes Extra Pale Ale infused with blueberries. It's described as crisp, refreshing and fruity. Just the cure for the blues. Trinity Brewing (Colorado Springs) - Coming up this Friday, February 8th, Trinity welcomes back their Chilly Water Baltik Porter to the tap lines. They ages this batch on whiskey barrels to create a marriage of the dark lager with whiskey and American Oak. Blind Worm guitars is then taking these barrels and making custom patio tables that will be enjoyable by all come Spring. On Valentine's Day, Trinity will debut their imperial stout - Passed Stout. It's the first time they've brewed this one in over 2 years. It weighs in at 11% ABV and is brewed with milk chocolate, cacao nibbs, and whole Madagascar vanilla beans. Bristol Brewing Company (Colorado Springs) - On special today, take a trip to Bristol and get $3 pints of their Red Rocket Pale Ale today from 4pm to 9pm. Ska Brewing (Durango) - On Friday, February 8th at 7pm it's going to be a Ska Winter Wonderland! A Pre-Valentine's Day Lingerie Fashion Show and Gift Boutique! Come for the show, stay for the beer and shop til you drop! Participating shops include Blu, April's Garden, Animas Chocolate Company, Signature Salon and Ska Brewing! Come check out the fashion show, enjoy a cold beer and leave with a special gift for your sweetie! Elevation Beer Co (Poncha Springs) - It's here! Señorita, a Horchata Imperial Porter and Elevation's Black Series winter release, is now available! This beer pays homage to Horchata, a classic Spanish-Mexican drink. It has the aroma of Vanilla, Cinnamon and sweet milk and hits your palate with Vanilla, sweet chocolate malts, and a hint of cinnamon. Available in 750ml bottles, on draft and in specialty firkins. It weighs in around 8.4% and has 35 IBUs. Try this and other Elevation Beers at a Satellite Tap Room event at West End Tavern tonight, February 7th starting at 6:30pm. Try one of 7 different Elevation beers on tap with hosts Xandy Bustamante and Christian Koch.